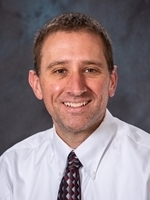 Rick Loutsch serves as the clinical education coordinator, assistant athletic trainer, and an instructor for Northwestern's athletic training program. He earned a doctorate of athletic training (DAT) degree from the University of Idaho and has a master's degree in exercise science from the University of Iowa. Professor Loutsch's research interests include clinical practice improvement and the evaluation and treatment of apparent hamstring tightness. Note: A fee is associated with this course. Loutsch RA, Baker RT, May JM, & Nasypany AM. (2015). Reactive neuromuscular training results in immediate and long-term improvements of measures of hamstring flexibility: a case report. International Journal of Sport Physical Therapy, 10(3):371-377. Baker RT, Warren L, Nasypany A, Bonser B, Hancock C, Hansberger B, Loutsch R, Stanford E, & Zeigel A. (June 2015). Apparent hamstring tightness: Removing stretching from your daily practice. Accepted Learning Lab at the National Athletic Trainers’ Association 66th Clinical Symposia, St. Louis, MO. Bonser, R. J., Hancock, C. L., Hansberger, B. L., Loutsch, R. A., Stanford, E. K., Zeigel, A. K., ... & Cheatham, S. (2016). Changes in Hamstring Range of Motion Following Neurodynamic Sciatic Sliders: A Critically Appraised Topic. Journal of sport rehabilitation, 1-16. Hancock, C., Hansberger, B., Loutsch, R., Stanford, E., Zeigel, A., Bonser, R., ... & Nasypany, A. M. (2016). Changes in Hamstring Range of Motion Following Proprioceptive Neuromuscular Facilitation Stretching Compared With Static Stretching: A Critically Appraised Topic. International Journal of Athletic Therapy and Training, 21(5), 1-7.